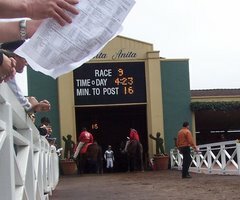 HORSE RACING TAKES, TRACK STORIES AND ASSORTED, RELATED STUFF. Somebody is gonna make Big Brown earn it. Worst Derby Ever? Yeah, that's pretty much become a cliche at his point. Is there even a question about that? I mean c'mon. I watched the race with my dad who was in front of a TV that wasn't attached to some kind of girder or wall, because it was the day of his granddaughter's (my niece's) first communion and we were all stuck at the post-communion party, otherwise he'd have been at the track. I usually like to be alone in front of the TV for at least an hour before the race. The ending of the race presented possibly the worst outcome imaginable. I am very grateful that my son wasn't old enough to comprehend what happened (4 years old). I'm always telling him about horse racing and horses and trying to get him interested in the sport. He does enjoy it, more than baseball or boxing (my other 2 favorites), and chooses to have me put on TVG over the Dodger game or Friday Night Fights. He wasn't even paying attention much to the race, since to him it was just another chance to ask me "I have #4, who do you have?," so I sent him out of the room as soon as I realized what was happening. Eight Belles breakdown made me sick, I've been in a low-grade depression ever since. It was terrible. There is not much more that can be said. I'm not sure how I feel about the sport at this point, although I want to defend it, what is there that can be said in defense? Should I raise my son on racing like my dad did with me? It seems like tragedy's like these are becoming more and more prevalent. As most know, racing has been canceled for the third consecutive day at Santa Anita due to drainage problems with the newly installed Cushion Track. I went out this morning just to check it out for myself and ran into an old friend of mine who happens to know quite a bit about what's going on at the track. According to him, from what he knows, when the Cushion Track was installed over the summer, the asphalt base was completely sealed off due to extreme heat (105+ degrees) at the time. And that's why it won't drain "vertically". It seems that the asphalt isn't nearly as porous as advertised. If this is true, it's worse than the official story. And it would seem that solving the problem is more complicated than most think. I'm not sure if this has been reported anywhere else but it seems to make sense. Another guy I talked to thinks it's that the sand in the track has coagulated, from the rain, preventing adequate drainage. That's more like the official story. But, the surface is the same as the one at Hollywood Park? And it's been raining there too. Everyone I talked to agrees that there is more to the truth than is being told by track officials. Any way you look at it, it seems that the smart thing to do is to tear the whole thing up and start over. They can't keep canceling racing every time it rains, since I think everyone agrees that they're going to have to put in a new surface anyway. Skywalker had a big day at Santa Anita on Saturday. Three of his grandkids won Cal Cup races. Take a look at him here in the '85 Santa Anita Derby (from my You Tube account). Man, did Pincay teach Gary Stevens a lesson that day. For lots of reason's I've only made it out to the track once since August 19 (Pacific Classic Day) and that was on Oak Tree's Opening Saturday (Commemorative Stein Day). Saturday I was home, watching the Breeder's Cup Championships with my 3-year-son, trying to get his little 3-year-old consciousness to care about the races when all he wanted to do was go outside and ride his tricycle. I enjoyed the races, especially The Turf Mile as one of my favorites, Kip Deville, put it all together "just in time" after an inconsistent '07 year. I was aware of George Washington, but as an American racing fan, I wasn't really aware of some of his great accomplishments, reputation or personality. How is it possible that a heroic horse like George Washington, who gave so many racing fans thrills and memories with his brilliant stretch running style could die in the stretch on a muddy, dreary day on the other side of the ocean, a year after his "retirement"? Just saying accidents or injuries "happen" doesn't seem to make any real sense. What we should say is that, since we're going to continue to race these heroic animals for our entertainment and industry, accidents will continue to happen, even on artificial tracks. I've defended the industry against critics, even after Barbaro's death, but what is there to say this time? George Washington wouldn't even have been racing any longer if he had proven to be more lucrative at stud. If there is any consolation at all maybe it's that the death of George Washington didn't happen in front of his home fans, it happened in New Jersey. After watching and digesting the 2007 running of the Pacific "Classic" I've come to one conclusion: The secret ingredient in Del Mar's new "Polytrack" is quicksand. I'm not trying to say that something must be "up" because Lava Man didn't finish in the money. That was bound to happen sooner or later. After all, they're horses not robots. But when the winning time is 2:07 and change for a 1 1/4 mile race, something is seriously amiss. This is a completely different sport than the one we're used to. And three horses that barely figured finish 1-2-3, the so-called "Classic" that resembled a walk-out 9th race of 16K claimers. A million-dollar "Classic" race isn't supposed to be a "great race for a bunch of 10-cent superfectas". You should be able to be at least somewhat certain you can pick at least one horse that will finish in the top 3 or 4. And now Student Council earns a automatic berth into the 2007 Breeder's Cup Classic. That's not a changing of the guard, that's a joke! A great field has been put together for Sunday's Grade I, $1 Million Pacific Classic at Del Mar (1 1/14 Miles on the Poly Track). Defending champion Lava Man is the 5/2 morning line favorite to repeat. The Mike Mitchell trained Big Booster is 9/2 on the morning line. I'm not sure if he merits 9/2. He ran 3rd in the Hollywood Gold Cup behind Lava Man and A.P. Xcellent who is 8-1. But Mitchell has been working miracles with former claimers like On the Acorn who won the San Juan Capistrano and Sun Boat who won the San Diego Handicap. Sun Boat is 6-1 and my gut tells me that a lot of "educated" money is going to be placed on him. Top West Coast 3-year-old, Tiago, is 6-1. He won the Santa Anita Derby and Swaps Stakes and ran 3rd in the Belmont Stakes in June. Other 3-year-olds in the race are Albertus Maximus (2nd in the Swaps) and Time Squared. Strub Stakes winner Arson Squad is 12-1. Rounding out the field are Student Council, Awesome Gem, Porfido, Salty Humor and Hello Sunday. It's a great field and a nice betting race. My heart tells me Tiago, my gut tells me Sun Boat and my head tells me Lava Man. We'll see.